Six Sigma US offers several training options in the Tampa area. In addition to lean six sigma Tampa certification for Yellow Belt, Green Belt and Lean programs, we also provide our popular four week Black Belt option in Tampa. The four week lean six sigma certification for Black Belt includes two weeks of our Green Belt program and two additional weeks selected from our Black Belt after Green Belt. Students registering for all four weeks at the same time will get a discounted rate of $6500. The four week lean Six Sigma Certification Black Belt also allows individuals from the same company to pursue Green and Black Belt certifications together, which promotes synergy and flexibility. In addition, we offer a number of onsite options, including our Six Sigma Champion course which is perfect for companies just beginning the lean six sigma certification implementation process. 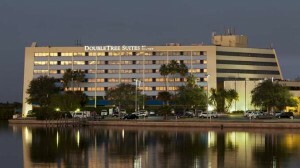 The Doubletree Guest Suites Tampa Bay hotel is an all-suite hotel located on the wateroverlooking Tampa Bay in the Rocky Point business area and moments from the Westshore Business District in Florida. Our full service hotel offers complimentary scheduled airport shuttle service to Tampa International Airport. Our Tampa hotel is within close proximity to Clearwater Beach, shopping, dining and only 12 minutes from downtown Tampa and the Tampa Convention Center. Call the Hotel and mention the Six Sigma Group to receive a discounted room rate. Our group name is under Six Sigma Management Training and the group code is SS2. You can make your reservations online at www.doubletreetampabay.com or by phone through our 24 hour consolidated reservation center at 1-800-222-TREE. When making your reservations please be sure to give the name of our hotel along with your group name or the group code. You may also contact our sales coordinator at the hotel, Nicole McDonald.